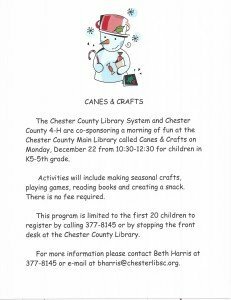 Chester County Library – Page 31 – "The HUB of Chester County South Carolina"
The Chester County Library System and Chester County 4-H are co-sponsoring a morning of fun at the Chester County Main Library called Canes & Crafts on Monday, December 22 from 10:30am – 12:30pm for children in K5 – 5th grade. Activities will include making seasonal crafts, playing games, reading books, and creating a snack. There is NO FEE required. This program is LIMITED to the first 20 children to register by calling 803-377-8145 or by stopping at the front desk at the Chester County Library. For more information, please contact Beth Harris at 803-377-8145 or e-mail at bharris@chesterlibsc.org. In the Spirit of the Season, the Board of the Chester County Library System has designated December 1-5, 2014 as Fine Free Week. Return outstanding books or movies and the fine will be waived. Any branch of the library will be able to receive any Chester County Library book or movie. This does not apply to Inter-Library Loan books or movies. 100 Center Street – Friday, December 5th, the hours of operation for the main branch will be 10:00am to 3:00pm. The early closing is due to the Chester County Christmas Parade in which our Bookmobile will be a part. Then on Saturday, December 6th, as part of the downtown Christmas in Chester, the main branch will have Mrs. Claus from 9:00am – 12:00pm, who will read Christmas stories to good little boys and girls. Each child will receive a free book. Books will be given as supplies last. Please use the side entrance. The rest of the main branch of library will be open regular business hours from 10:00am – 2:00pm. The three locations of the Chester County Library will be closed in observance the following holidays. Tuesday, November 4th for the General Election. Tuesday, November 11th for Veteran’s Day. Thursday, Friday, & Saturday November 27-29th for Thanksgiving. Wear comfy shoes and bring a flashlight. Please come out to the Chester County Library this Tuesday at 6pm for the Library Board Meeting. If you have thoughts or concerns, feel free to come by. Everyone is welcome! Your thoughts matter! Saturday, we will have Family Game Day from 10am – 2pm! Fun for everyone! Board games, video games, card games, gamer games! Come on by! Limited to 10 people, sign up at the front desk. Dial – a – Story Call 377-4545 to hear a story read ANYTIME. Story changes every 2 weeks. For more information on these or any other children’s programs please contact Beth Harris at 377-8145 or by e-mail at bharris@chesterlibsc.org. Chester County Library to Host Workshop on Ancestry.com. Are you interested in your family history? Have you begun work on your family tree and gotten stuck? The Chester County Library has a resource that may be able to help in ancestry.com. On Saturday, August 23 from 10 – 11AM at the Main Branch of the Chester County Library, Tally Johnson, Special Services Manager for the library, will be conducting a workshop using Ancestry.com in your family history research. Space is limited to jsut six patrosn and you will need to sign up at the Chester County Library Main Branch. Access to the website will be done via the Library’s account, so no changes will be permitted to your personal files. Ancestry.com is a privately held Internet company based in Provo, Utah, United States. The largest for-profit genealogy company int he world, it operates a newtork of genealogical and historical record websites focused on the United States and nine foreign countries, develops and markets genealogical software, and offers a wide array of genealogical related services. As of December 2013, the company provided access to approximately 12.7 billion records and had 2.14 million paying subscribers. User-generated content included 191 million updloaded photos and more than 16 million uploaded stories. In addition to its flagship site, Ancestry.com operates Archives.com, Fold3.com, ProGenealogist, 100memories.com, Newspapers.com, Genealogy.com, MyFamily.com, and Rootsweb.com. Family Tree Maker software developed and marketed by the company is advertised as “the #1 selling family history software”. We will be Closed on Monday, September 1st in observance of Labor Day. Join the fun this summer and enjoy the cool air conditioning at the library along with great movies! All three Chester County Library locations will be closed on Friday July 4th & Saturday July 5th in observance of the Independence Day holiday. Before you vote, check out our Voter Information Page. The Chester County Library System will offer a six week Summer Reading Program “Fizz, Boom, Read” at each of our three libraries for children ages 2 through th grade, and a Young Adult Program “Spark a Reaction” for grades 6th – 12th at Chester County Library Main. Our Tot Trot program includes stories, crafts, fingerplays, music, and games. Our hour long Book Trek for K5-5th grade children features books, crafts, experiments, games, guests, and music. There will also be paid performance by the South Carolina Aquarium Rovers on Monday, June 30th at each branch.